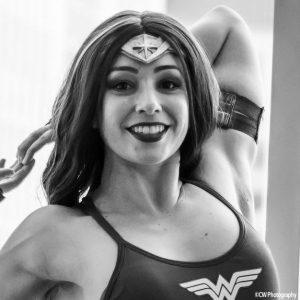 Molly Virello is a Connecticut based cosplayer with a passion for yoga, bad jokes, and all things comic related. Whether she’s volunteering, making her own costumes based on the plethora of source material available, or creating geek themed yoga classes, Molly is all about loving where you are and who you’re with. In addition to making her own costumes, Molly is a RYT (Registered Yoga Teacher), has three years of teaching under her belt, and is trained in Yin yoga, Vinyasa flow, and Gentle yoga practices.